This article has been updated (02 May 2014) to reflect changes in the Google News Archive access to the Ottawa Citizen and Ancestry.ca Search pages for the Ottawa Journal. most from the Prairie provinces. You’ll see Ottawa Journal, near the top. Click and on the search page choose your Year Range. HINT: You’ve got to look at the dates carefully … for some reason the dates are not arranged chronologically in the list! They are all there, just not in calendar order! Since the collection is not indexed, you can’t save what you find to people in your tree. But do make a screenshot of your article! You can then add it to your tree using the “Add Media” button. 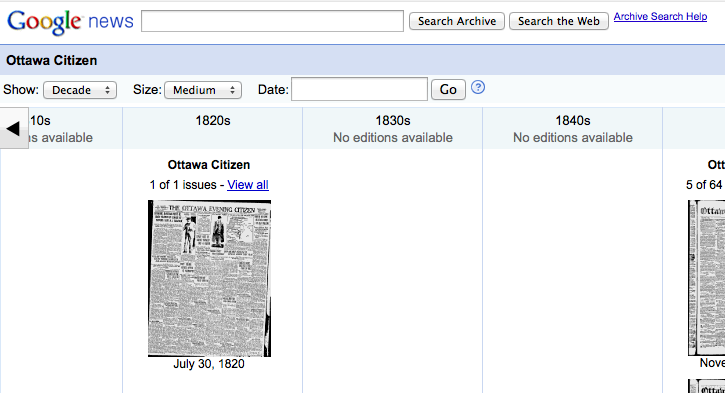 Ottawa’s other daily, the Ottawa Citizen 1820-1990, is available online in the Google news archive. This was a Google project that became controversial … When newspapers with long histories, who are still around today — though no longer able to claim the copyright for their early issues — objected to Google putting the microfilm images online for free, Google began helping them to set up pay-per-view archives for themselves. What we have in the News Archive are the microfilms of an amazing number of newspapers digitized for online access .. for free! Apparently as a result of agreements with the newspapers, though the news archive is still online, it’s like a trek through the Himalayas to get to it! And the ability to search, since 2013, is now severely limited. But they are still online! Thank God for little favours! in 2011, Google eliminated the search homepage so now you need to go here. Wait a moment for the search box to appear that says Search for news stories that have .. and fill in your search words. In the source box at the bottom, enter ottawa citizen HINT: it seems that in the mobile version of the Google site you need to click the drop down menu — the downpointed arrow — in the search box HINT: I’ve found that trying your desired words or name successively in all, exact and one of these improves results. The Optical Character Reader software associated with the archive is a very early version, so trying different approaches and versions of the same item can help. (For example, Wesley McEwan, Mrs. Wesley McEwan, obit McEwan, etc.) There are gems to be found, and afterwards you’ll feel like Sir Edmund Hillary at the top of Mt. Everest! The great disappointment with the Google News Archive is the constant changes being made to the way you access it. In 2013, Google killed the search box access from the News section. It’s all still there. Just how to access it? And how to search it? Once there, take a look at the vast number of historical editions of many newspapers that are accessible! Click the letter O in the alphabet across the top to find the section of “O” newspapers, then click Ottawa Citizen. This is the easiest way to start browsing. The word search for a particular newspaper … well, that’s gone. The best alternative you can do is a word search of the (whole) news archive itself. Given the quality of the early OCR software employed, it’s tough to get a hit. Here are some ideas for striking gold. Next to the words Google news, you’ll see the Search Archive searchbox. Enter your phrase (like McEwan). I recommend adding the town or town and province, or newspaper (Ottawa Citizen) to help limit the results. Click the Search Archive button. This is the bottom of the first page of my results for McEwan, Ottawa Citizen. You can see that it produced 8 pages of results. Since the results don’t show the newspaper issue date (like Feb. 1, 1942), but instead Google’s newspaper page id, you have to check the summation and possibly review them all. The one shown here is an article about my great grandparents, Mr. & Mrs. David Cadieux, that mentions their daughter (my grandmother, Mayburn McEwan nee Cadieux). And on a completely different subject … The title of the interesting Wall Street Journal article tells it all. When a Genealogy Hobby Digs Up Unwanted Secrets. It claims 1 in 5 researching their family history will come upon some “unsavory” surprise! Have you? Nothing is more frustrating than discovering the address where an ancestor lived, but not being able to locate it on a map. It’s not just a modern problem with new subdivisions and the joining of towns under a single name or changing of town names. This old clipping from the Ottawa Citizen in April 1933 is a reminder. Place name gazetteers are a big help. Many will point out historical names no longer in use. For unfamiliar names, you can find a location easily thanks to the links provided by McMasters University Libraries website. For general information, and some specific Canadian historical place name gazetteers, the FamilySearch wiki is helpful. A Scotland gazetteer website provides names as well as info on clans and historical events.